This interesting surname is a patronymic form of the personal name "Hudde", itself having three possible origins. Firstly, it is a pet form of the Old Saxon "Hugh", a personal name meaning "mind, spirit, heart" from the 7th Century, and popular with the Normans after the Conquest of 1066. Hudde is also a pet form of Richard "Hudson" translating as "the son of Hud". An Olde English personal name, "Huda", gave its name to places such as "Huddington" in Worcestershire. Hudson itself is widely distributed in England, and is especially popular in Yorkshire. This is also the 'home' of the variant 'Hutson' - a dialectal transposition, of which the first recording may be that of August 16th 1618, when Mogerit Hutson (!) was christened at Nunkeeling, Yorkshire. In Scotland the earliest record of Hudson is probably that of James Hudson, a charter witness recorded in the register of Kelso Abbey in 1466. 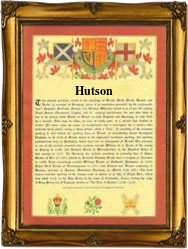 Variants of the Scottish name include "Hudsone" in 1567, whilst "Hutson" is recorded there in 1637. Diminutives of Hudson include Huddy and Huddle, found in Devonshire and Cornwall. Amongst the many famous nameholders was Henry Hudson, 1580 - 1611, who is credited with discovering the 'North West Passage' and Hudson's Bay in Canada. Michael Hudson, who died fighting in the Second Civil war 1646 - 1648, was chaplain to King Charles 1st, and Scout Master to the Northern Army. The first recorded spelling of the family name is shown to be that of William Hudde, which was dated 1273, in the "Hundred Rolls of Cambridgeshire", during the reign of King Edward 1, known as "The Hammer of the Scots", 1272 - 1307. Surnames became necessary when governments introduced personal taxation. In England this was known as Poll Tax. Throughout the centuries, surnames in every country have continued to "develop" often leading to astonishing variants of the original spelling.